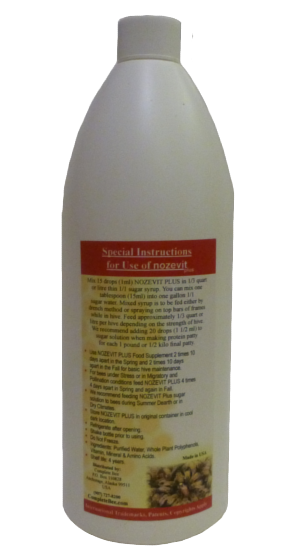 Mix 1ml (1/5 teaspoon) Nozevit Plus in 10 oz. sugar syrup and apply by spray or drench method directly on top of frames in hive and repeat feeding 10 days later. Feed Nozevit Plus in syrup solution in early Spring, during Summer Dearth in dryer climates, and in late Autumn prior to winter. A small 50ml (1.7 oz.) bottle goes a long way, mixing with up to 4 gallons of light syrup. This is the minimum recommendation for basic hive maintenance. You can mix heavier concentration and apply 4 times 4 days apart depending on hive and environmental conditions. Some beekeepers use up to 12ml (2 ½ teaspoon) per gallon syrup in hive feeder applications with great results. Mix at the rate of 12ml (2 ½ teaspoons) per gallon syrup solution and apply by spray or drench method at the rate of 1/3 quart or 10 to 12 ounces mixed Nozevit Plus solution per colony, 4 times, 4 days apart for maximum benefit. After spraying or drenching hives we recommend immediately filling and feeding Nozevit Plus on same hive with mixed syrup solution at the rate of 1 to 2 teaspoons per gallon of syrup in hive feeders. We recommend applying Nozevit Plus at above concentration and frequency in the early Spring as soon as possible to help promote hive health and production, during Summer dearth in the dry areas of the country when you would normally provide feed for your bees, and in Late Autumn to help hives consume feed, get cleaned up and prepared for winter. Bees have been known to prefer syrup with Nozevit Plus two times more than plain syrup. 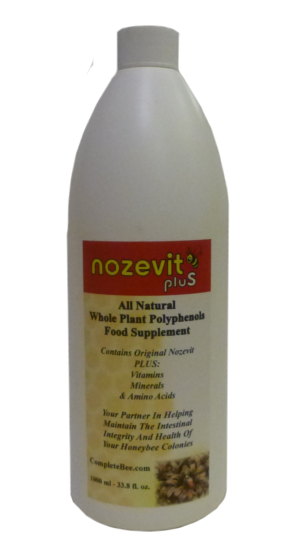 It is always recommended to add Nozevit Plus at the rate of 1 ½ml (1/3 teaspoon) per 1 lb. final weight protein patty to encourage consumption and give all the added benefits of Nozevit Plus to the bees. Only the highest quality, all natural, Q. A. L. Certified Organic components are used in the making of Nozevit Plus in equipment specifically designed and dedicated to the production of Nozevit Plus. We control all phases of production in house. To produce a quality product that works and is made of nothing but the finest quality ingredients available in the world takes time, dedication, clinical testing, field testing, and a highly qualified team of International Botanists, Micro Biologists, Doctors of Veterinary Medicine, Clinical PhD Scientists, Lab Assistants, Herbalists, and many, many beekeepers from all around the world. Nozevit Plus is just such a product. All Natural, Clean, Effective, Economical, Environmentally Friendly, and Simple To Use.